When Andy Rubin’s Essential finally announced the details surrounding its first smartphone, people got excited. However, the excitement quickly started to fade away as the company missed shipping dates. Finally, we’re hearing when customers will be able to get their hands on the phone, and it’s a lot sooner than we expected. 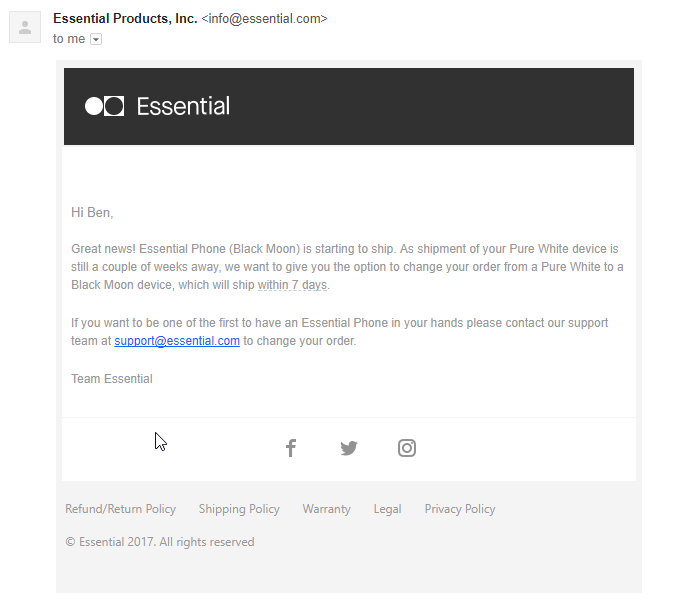 Rewinding to last week, Essential teased that it would reveal the date of launch for the Essential Phone “in a week.” That was Wednesday, August 9th, and today on Wednesday, August 16th, the company is living up to its word and giving us some more information. An email sent out to some potential buyers who pre-registered for the phone, myself included, reveals that the company is prepping to ship the phone in the next 7 days. Great news, your phone has been built! We now just need your payment details and we will ship within 7 days. If you would like to change the items in your reservation prior to checking out, please contact our support team at support@essential.com. If you reserved an Essential 360 Camera, you will receive a separate email as soon as it’s ready to be shipped. Your Essential Phone is unlocked, future-proof, and designed around you. For a limited time, we’ve also made it easy for you to get the phone for as low as $29.13 per month. In my case, the email gives me the option to change the potential order from a “Pure White” model to a “Black Moon” model since that one will be available first. We still don’t have a specific release date for the phone, but this is a good sign that the release is imminent, at least for the black model. Essential is set to give another “first look” at the phone at events in New York City on August 21st and another in Los Angeles on the 25th.